Now that spring is in full swing, I’m seeing so many great warm weather items I’d like to add to my wardrobe for this season and summer. I actually just placed a somewhat larger order over on Nordstrom for a bunch of items, so we’ll see what works! I’ll probably do a try-on session over on Instagram Stories once I get it all… stay tuned! In keeping with this light and fresh color palette, this little white off-shoulder dress would make for a great coverup or casual weekend option! This modern utility jacket is a stylish topper for work, the weekend or travel. Loving this oversized linen boyfriend shirt. I’d probably buy it in the natural tan color! A great neutral to pair with white jeans. How cute is this chambray jumpsuit?! Obsessed. The tie waist adds a flattering touch. 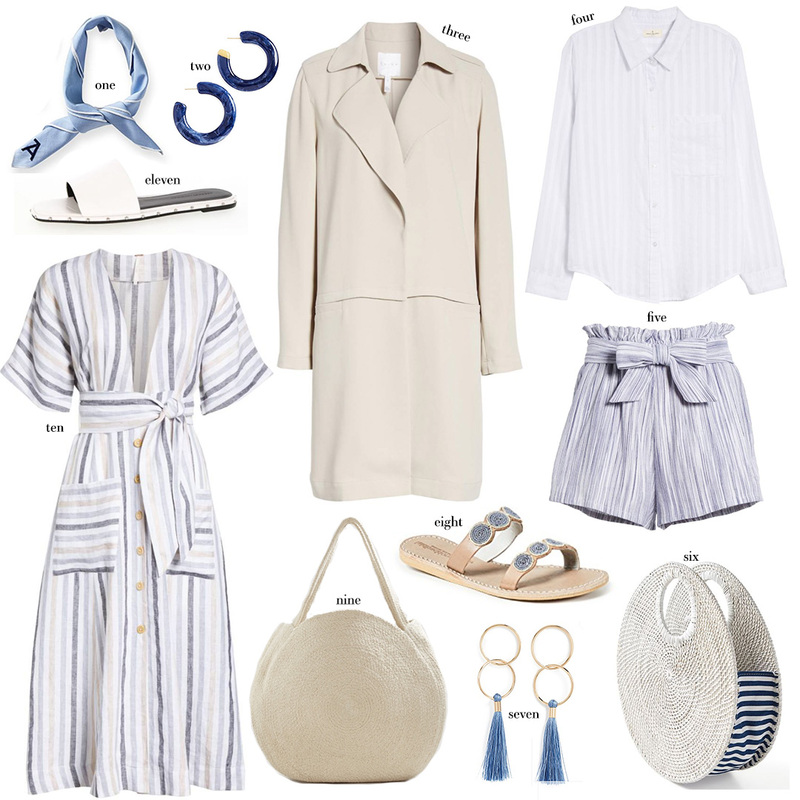 Adore the easy and effortlessness of this striped shirtdress. So chic with a pair of flat sandals for summer travel! Stock up on some new PJ’s for summer with this set that’s on sale from J.Crew! Looking for an Easter dress? Try this one in blue. This straw circle bag looks very Clare V. for under $50! Pack this strapless dress to wear over your bandeau bikini to the beach. I need #10! What a cute dress! So many goodies! Love them all!